The picture at the top of the page is what I got. It's not the greatest moon shot in the world, but for a spur of the moment, run outside and snap away, I'll take it. However, one of these nights I might actually have to plan for some good pictures of the moon. I can use a lot of the same tips I've already written about in How to take fireworks pictures. I'm going to continue to use the manual settings on my camera, but I'll take a few more test shots at different settings. Ideally I'd own a light meter. However, just like with fireworks, it might be more interesting if I could position my tripod to try to capture something interesting in the foreground .. even though it will almost certainly be in silhouette. What are some of your favorite secrets for getting really good pictures of the moon? 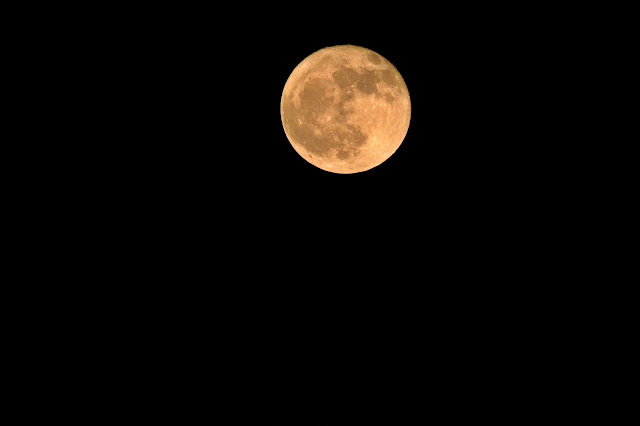 Good shot of the moon, but knowing you as I do, you won't stop until you get a "perfect shot" of the moon. Good luck with it and be sure to send it to me so on your blog. God bless and keep up the great work you are doing Mr. Camera Man.